Here is an incredibly vague “recipe” of how to prepare goose. From everything I have read for this post, a goose is either the easiest bird to cook or the most difficult. You do not roast it as you would a turkey or chicken, but maybe you could roast in a similar fashion to a turkey or chicken. Some recipes say breast up, others say breast down! There does not seem to be a happy medium on opinions. In a very general sense, the goose is browned, then stuffed and roasted. That appears to be the similarity in most of the methods I read. 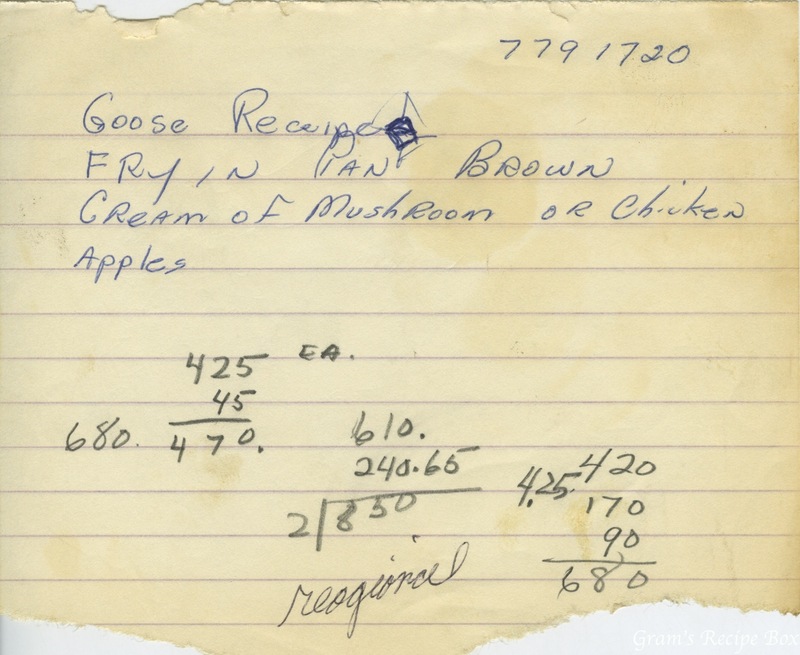 This little note appears to be for a method in which the goose is cut apart, then browned and roasted with the soup or broth. The apples and/or other fruits are added toward the end of cooking. Being as a Christmas goose is more known as being a British meal, this link will take you to Gordon Ramsey’s method for roast goose. Here’s a link to a method created by an experienced hunter that cuts the goose apart during cooking. All seem to agree the meal is delicious and worth the effort. In the spirit of American Thanksgiving tomorrow, I hope whichever bird you decide to roast, bake, deep fry or otherwise prepare and serve tastes delicious and you enjoy a lovely time with family and friends!